Who could miss the palpable cuteness of puppies and kittens on YouTube, and their mass produced surrogates in cartoons, video games, on logos, as branded accessories and as soft toys. The word “cute” is an abbreviation of “acute,” meaning clever, keen-witted, sharp, and shrewd, according to the OED. In her extensive exploration of cute as a viable contemporary aesthetic category, the literature scholar Sianne Ngai notes that sometimes unstressed syllables get thrown away, so “alone” becomes “lone,” “until” becomes “til,” and “acute” becomes “cute” (87). In the case of the word “acute” the removal of the first vowel changes it from sharpness to its opposite. After all, in everyday vernacular speech “cute” implies something infantile, vulnerable, fuzzy and blobby such as a stuffed toy, a kitten or a baby. Ngai notes that diminutives are born of such abbreviations, as when we affectionately shorten people’s names: e.g. Robert becomes Rob (my example). We then add extra syllables to infantilize the word further: Rob becomes Robbie. As she indicates in the case of “cute” we have “cutie,” “cutesy,” “cutie-pie” and even “cutesy-poo” also in the OED. Cuteness gets raised to a higher power. Cute has other connotations. In US sitcoms it’s common to hear one teenager describe another as “cute,” meaning attractive in some way — with an allowance for a bit of quirkiness I think. The dictionary also says that cute means “cunning,” which fits the sharpness aspect of its origins in “acute.” So the ambiguous, cunning characters of Puck, Pan, Harlequin, Hermes, coyote, fox and other instances of the Trickster archetype are also cute. Ngai’s fascinating study is called Our Aesthetic Categories: Zany, Cute, Interesting. I was surprised she doesn’t make the Trickster connection in that book, as that would align what she regards as the ambiguity and duplicity of the cute character with the madcap, hapless, accident-prone zany clown, which she also discusses at length. I think she’s keen to point out that cute is a newish, late industrial aesthetic category, albeit with a legacy going back at least to Edmund Burke on the sublime: “Beauty in distress is the most affecting beauty” (135). We are attracted to people and things that appear vulnerable. More recently, Japanese kawaii culture (Hello Kitty, etc) emerged from Japan’s loss of power in the wake of World War II. Stylised blobby cutes are vulnerable and worthy of everyone’s care, like the increasingly impotent ageing Emperor. Soft toys can also be beaten up and bashed about, yielding against the inevitable roughness of children’s play. Ngai observes that as an adjunct to their main business some carpenters, tailors and metalworkers may have run a line in children’s toys, but this industry was eventually overtaken in the era of mass production by specialised workshops and specialised designs. Earlier toys were more hard-edged, rigid and ornamental than soft and robust. Ngai also points to the consumerist aspect of cute things. Cuddly commodities want us to take care of them as they cry out to us for purchase: “The cute commodity, for all its pathos and powerlessness, is thus capable of making surprisingly powerful demands” (64). I take it that cute things are like whimpering puppies in a pet shop competing for our attention. She mainly concentrates on how certain avant-garde artists and writers have adopted the cute aesthetic. Here’s an example from my own encounter with the work of the Japanese artist Yayoi Kusama at the Louisiana Museum of Modern Art in Denmark. 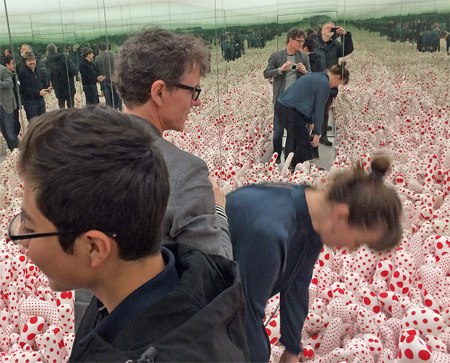 It’s a mirror room full of inflated polka dotted dildos called Phalli’s Field. Ngai doesn’t address architecture or space in any direct way, but as I read her work I can’t help but think of the tendency towards the organic and the blobby in biomorphic architecture, though because of its scale it’s even more ambiguous than a soft toy. In architecture the cute transitions inevitably and mercifully into the grotesque. Ngai’s seminal work draws on many sources, including others who have developed theories of the cute aesthetic. Ngai shows that in Japanese kawaii sounds a bit like kowai which means scary (83). She references the following New York Times article, which provides a compelling summary of the biology of cute: Angier, Natalie. 2006. The cute factor. The New York Times. Also see Why cartoons have animals, Shojo Manga morals, Stupidities, and Shape shifting architecture. 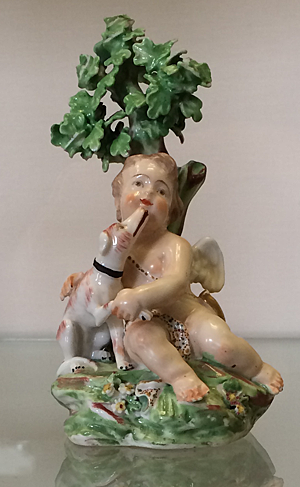 The first picture above is a china figurine of Cupid with dog (1770-80) at the Fitzwilliam Museum, Cambridge. 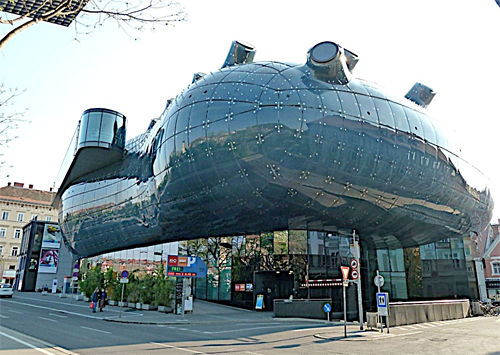 The final picture is the Kunsthaus, Graz, Austria, 2004 by Peter Cook and Colin Fournier. I’m grateful to Jack Belloli and the Materials and Practice Group at Cambridge University for introducing me to the work of Sianne Ngai. Burke, Edmund, and James Boulton (ed.). 1958. A Philosophical Enquiry into the Origin of our Ideas of the Sublime and Beautiful. Notre Dame: University of Notre Dame Press. First published in 1757.